In the context of this primeval Cain, or the ‘new’ Cain, the ritual ceremonies enacted by Steiner between 1905 and 1914 acquire their true meaning: as a way to incorporate previously developed spirit knowledge into the human soul and into physical reality. Here the practical occultist increasingly identifies with Hiram, the central figure of the Temple Legend, in order to realize the new Cain within him. Meyer demonstrates the direct line from Rudolf Steiner’s early ‘rites of knowledge’ to the Class lessons of 1924, which Steiner had intended to reinvest with a ritual element. Besides reflections by Rudolf Steiner and editor Thomas Meyer’s commentary, this volume includes important thoughts by Marie Steiner, W.J. Stein, Ludwig Polzer-Hoditz and Rudolf Geering-Christ. The final chapter is a lecture by D.N. 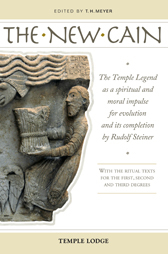 Dunlop – perhaps Steiner’s most important pupil in the West – that reveals the universally human core of the rituals we encounter both in traditional freemasonry and in Steiner’s own rites. T.H. MEYER was born in Switzerland in 1950. He founded Perseus Verlag, Basel, in 1990, and the monthly journal Der Europäer in 1996 (with the English edition, The Present Age, appearing since 2015). He is the author of several books including Barefoot Through Burning Lava; Milestones; In the Sign of Five; Ludwig Polzer-Hoditz, A Biography; D.N. Dunlop, A Biography; Rudolf Steiner’s Core Mission; The Bodhisattva Question; Clairvoyance and Consciousness and Reality, Truth and Evil. He is also the editor of Light for the New Millennium. Meyer has written numerous articles and gives seminars and lectures around the world.